226 pages | 41 B/W Illus. 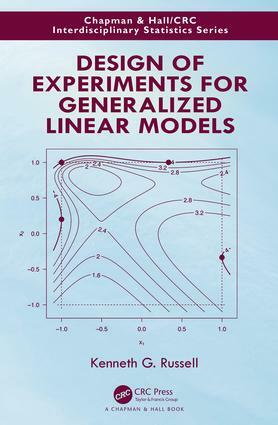 Generalized Linear Models (GLMs) allow many statistical analyses to be extended to important statistical distributions other than the Normal distribution. While numerous books exist on how to analyse data using a GLM, little information is available on how to collect the data that are to be analysed in this way. This is the first book focusing specifically on the design of experiments for GLMs. Much of the research literature on this topic is at a high mathematical level, and without any information on computation. This book explains the motivation behind various techniques, reduces the difficulty of the mathematics, or moves it to one side if it cannot be avoided, and gives examples of how to write and run computer programs using R.
This book is aimed at readers who have done elementary differentiation and understand minimal matrix algebra, and have familiarity with R. It equips professional statisticians to read the research literature. Nonstatisticians will be able to design their own experiments by following the examples and using the programs provided. "Dr Russell has produced an accessible and informative text that provides useful methodology for applied researchers and practitioners, and a good introduction for postgraduate students wishing to start researching in the area. Design of experiments is fundamental to the scientific method but, when non-normal data is anticipated, too often either little thought is given to the design, or inappropriate designs tailored to linear models are applied. This book provides the background and methods, including R code, required to start designing better experiments in such situations. The coverage ranges from relatively simple, single factor experiments to multi-factor studies and Bayesian designs using recent research results, making is a valuable addition to many different bookshelves." K. G. Russell is at the National Institute for Applied Statistical Research Australia, University of Wollongong.